Who: Hexham Town Council, Northumberland County Council, and charity Sustrans. What: The councils wanted to gather public opinion about Hexham Marketplace to shape improvement plans for the area. Result: Hundreds of comments were collected, helping the councils construct their rejuvenation plans. Hexham Town Council and Northumberland County Council wanted to design improvements to the area around Hexham Marketplace. They teamed up with national charity Sustrans which used Stickyworld as an innovative and inclusive way of crowdsourcing people’s ideas and feedback. Hexham Town Council and Northumberland County Council wanted to improve Hexham Marketplace and make it more pedestrian friendly. They asked Sustrans, a national charity which supports people travelling by foot, bike or public transport, to carry out an extensive public engagement exercise. 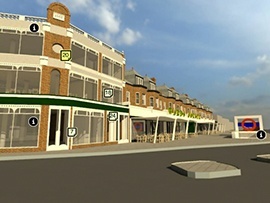 Sustrans’ brief was to involve as many people in Hexham as possible in the development of some concept designs for the marketplace. The council’s wanted to highlight that residents and traders had an important voice in any decisions made about changes to the area. Sustrans set up an online ideas forum on Stickyworld to complement and extend their face-to-face and more traditional forms of engagement. Available 24/7 it gave more people in Hexham the opportunity to have their say and provide ideas. The team populated the ideas forum with an engaging and personal welcome video from the Mayor of Hexham, 360 degree panoramic views of the marketplace and historic photos. The panoramic photography was taken early in the morning using a smart phone and was quick and easy to upload. People were then asked and encouraged to leave their thoughts about the area and highlight any issues. Using Stickyworld’s commenting capabilities they were able to stick their ideas exactly on the relevant part of the panoramic image enabling them to provide a specific point of view about a feature. Sustrans also shared a map of the area in the forum. With Stickyworld’s sticker feature, the public were able to mark areas on the map that they approved of, had issue with, and to propose new ideas for future improvement. This was a great way of crowdsourcing ideas. 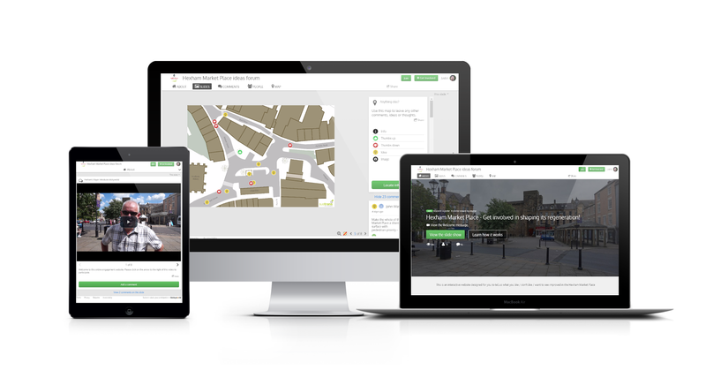 Kieran McSherry, Sustrans Senior Urban Designer, commented, “People found the online ideas forum really quick and easy to use. Providing a convenient online way for people to have their say was an important part of our engagement strategy and extended the opportunity for everyone to contribute”. Sustrans promoted the availability of the online forum as widely as possible by sharing a link to it in the local press, via leaflets left with shopkeepers and during face-to-face events. Rather than having to manage capturing feedback provided during events, the team also added this to their Stickyworld room. This meant that when it came to analysing the comments the majority of feedback was in one place and it was quick and easy to download into a format ready for analysis. Stickyworld helped Sustrans to stimulate nearly 500 comments and ideas about the future of Hexham Marketplace. The transparent nature of the online ideas forum meant people could see each others ideas and start productive conversations. The Sustrans team were able to respond and engage with participants when relevant, and to thank them for their participation. If you would like to learn how an online ideas forum could work for your organisation, book a demonstration with our team.